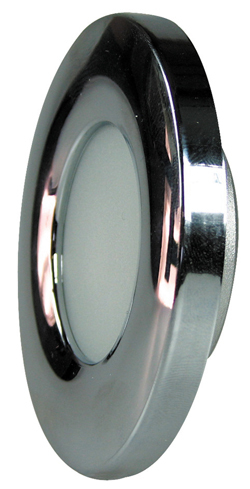 N05LPR comes in a choice of three mirror finish covers: gold, 316L stainless steel, and white enamel. Stainless steel shown below. 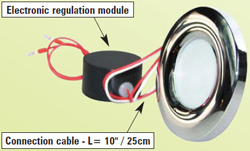 High-quality, low-cost LED in a traditional spotlight design. Remote electronic regulation module. 12/24 volt. LED Bright Light fixtures have innovative current regulating internal electronics that keep the fixture warm not hot to the touch. Compare to halogen and xenon bulbs which burn so hot that they can be a fire hazard if not installed properly, and regardless will cause a fire if certain flammable objects are placed too close by mistake. LED Bright Light fixtures have no effect on printed colors and artwork. Compare to halogen and xenon bulbs, which emit UV rays which will fade printed colors and artwork, causing irreparable damage to your priceless possessions. Voltage range: 9 to 28 volts DC. No polarity. For pricing and availability please contact us. Contact Us Copyright © 2009 LEDBrightLight.com. All Rights Reserved.